Bellomy, 44, is the co-founder and brewer of Dovetail Sake in Waltham, Massachusetts. He is hearty and round, a big guy from a tiny town in rural Maine. The sort of guy you’d expect to be a beer home brewer, even a welder or pipefitter. Not a man who is fluent in Japanese and in the intricacies of artisanal sake brewing. Following college and a lifelong obsession with all things Japanese, Bellomy and his co-founder, Dan Krupp, 36, decided to open the first sake brewery in New England. The two share a single-mindedness crucial to successful entrepreneurs: a desire to be the best. In their case, they are focused on making the best sake in the world brewed outside of Japan. Given their performance in the recent Hasegawa Saketen Sake Competition in Tokyo—they beat 21 other companies to win best foreign entrant—they will close in on their goal within the year. Sake is a Japanese wine made from fermented rice. It is brewed like a beer, but drinks like a wine. Sake’s alcohol content hovers about and above 14%, much closer to wine’s punch than to the measly 3%, 4% or 5% alcohol content in most beers. But it is harder to brew sake than to make wine, Bellomy says. Wine gets all its alcohol from the fermentation of the natural sugar in the grape; sake brewing is a two-step process. First the starch in the rice grain is fermented by the koji; after that, yeast is added to the batch to turn the starch into sugar, resulting in a clear, sweet, rewarding alcohol. Improbably, Dovetail sake is brewed in a small but spotless garage on an industrial side street in Waltham. Bellomy and Krupp have been working on the brewery for two years. Their first batch went on sale on April 1, 2016. They currently brew two sakes: Nakahama Junmai, a dry, tight filtered sake; and a cloudy, sweeter unfiltered Ômori Nigori. The Junmai takes about two months to brew, the Nigori takes half that. “Less time for the sweeter sakes,” Bellomy says. But don’t rush to the store for the premier cru of either wine. It sold out instantly. High-quality sake, though ideally served cold, is suddenly hot. Bellomy, who worked for over eight years at Boston Beer Company, has a natural instinct for the brewing process and had lots of exposure to the beer and beverage industry during his years with Sam Adams. Given his years steeping in all things Japanese, it was natural for him to toy with the idea of a home-brew sake. He’d been a hobby home brewer, even experimenting with a beer-sake blend with another local home-brewing enthusiast. As the beer company grew more corporate, cubicle life led to an itch to start a sake brewery. Bellomy began holding sake education and tasting events around Boston. Dan Krupp came to one of Bellomy’s sake events. He’d been thinking about a sake-focused business himself, and though he wasn’t a brewer, he was a trained chef with a passion for Asian flavors and an interest in the business side of food and beverage. The two joined together, figuring the Boston wasn’t big enough for two sake entrepreneurs. They spent the next two years on R&D to launch their company. The name Dovetail appealed to these two sons of New England­­, one from rural Maine and the other from Newton, Massachusetts. It connoted the perfect joinery of handmade furniture, and had the virtue of being decidedly not Asian. “We want everyone to know that Dovetail is American-made sake. We aren’t in Japan or pretending to be Japanese. We want to be known as the best sake you can taste made outside of Japan. Period,” says Bellomy. A traditional beverage in Japan, sake is mentioned in ancient texts and pictured in thousands of ancient scrolls and screens. In that country today, the beverage’s growth curve seems to have peaked as young Japanese discover international brands of liquors and wines. But in the U.S. artisanal sake is riding a crest of interest, on a path made familiar by the craft beer movement. Obviously, with over 4,000 craft beer brewers and an estimated two new breweries launching daily, the craft beer movement dwarfs the sake industry, which has only 12 domestic breweries and perhaps another two or three opening yearly. But the dynamic is the same. Nine out of 10 of us in the U.S. have had our first sip of sake at a sushi restaurant. It’s often served warm, in cute little wooden or porcelain cups, and to my uneducated palate, the takeaway was more reminiscent of warm human sweat than a fine alcoholic beverage. But good sake, excellent sake, as I have discovered working on this story, is a whole different matter. Craft sake is busting out of the Asian restaurant cluster and coming to a fine-dining spot near you. Be prepared to think of sake as your new drink of choice, as an aperitif or as a complement to any well-crafted meal. The machinery is spotless. Gleaming stainless steel tanks and tables studded with gauges and dials. The feel is much more high tech drug lab than quaint Asian teak. Getting the equipment built to specs was one of the challenges in launching Dovetail. Everything had to be special ordered, some fabricated in Japan, other components constructed domestically to exacting specs for an infant industry. Actually, everything about opening Massachusetts’ first sake brewery was complicated. Brewing alcohol for retail sale is a highly regulated undertaking at both the federal and state level. The logistics of getting permission and the means to create the brewery were exhausting and expensive, and had to resolve before the first test batches were brewed. “The state had no paperwork that matched the requirements of sake, a wine brewed like a beer, so we had to fill out the paperwork for both!” says Krupp. Bellomy grew up in Winterport, Maine, population just over 2,000. “The highest aspiration you could have in my blue-collar hometown was that you might go to college and get a good steady job. No one thought about doing anything or studying anything just because you were interested in it.” He fell in love with martial arts as a boy and became obsessed by Japan. Ultimately he found his way to the University of Massachusetts in Amherst where he could major in Japanese. At a certain point, he just couldn’t handle the time demands of upper-level Japanese language classes combined with full-time work, he says, the frustration still raw. So with 96 academic credits banked, Bellomy took off and headed to Japan for two years of travel and work. By the end of his first year in Asia, he was fluent in Japanese. He also became fluent in Japanese food and beverage, including sake. “I’d had sake a few times in the U.S.—like everyone else, at a sushi restaurant. I wasn’t very impressed,” Bellomy says. But as he started exploring the cuisine and beverage scene in Japan, he was introduced to authentic Japanese sake, and fell in love. “A friend took me out to a local pub, and I was served a cup of sake –– and it was super delicious. I assumed that they’d broken out a special bottle for me as a guest. But as I went on to taste more and more sakes, I realized that it is all very, very good. In fact, in Japan, it’s hard to get a bad cup of sake.” Sake became a central obsession. He became familiar with all the brands, read the weekly sake column in Japan’s English language newspaper. Why don’t we have better sake in the U.S., he wondered? It’s a complicated answer, two parts consumer education, one part market demand and perhaps three parts rice. Although there was a history of domestic sake brewing in the U.S. before Prohibition, with breweries in San Francisco and in Honolulu, imported sake was a product of the postwar period. As an experiment, an exporter loaded a pallet of low-quality sake next to the pallets of chopsticks he was selling to Chinese restaurants in the U.S.
Asian restaurants warmed the sake to mask the quality of the beverage. “Heating doesn’t improve the quality of any alcoholic beverage,” Bellomy says. “Heat evaporates and volatizes the alcohol and leaves the flavor flat.” Nonetheless, warm or hot sake became a staple at Asian restaurants, lending depth and perceived authenticity to the wine list if not any real zip. And even if you found a liquor store that carried sake, you had no idea if the bottle had been on the shelf for four minutes or four years. But the second part of the answer is more interesting: Other than the specific fermenting agents like koji and yeast, sake is all about the rice. Yep, rice. And we ain’t talking Uncle Ben’s. Remember that rice is the “fruit” that makes sake. Just as the right quality grapes make the best quality wine, it should be no surprise that the best sake is made from the best rice. In Japan there are over 170 strains of “brew”-specific rice, (rice used for brewing but not necessarily for eating), and the champagne of sake rice is a strain called Yamada Nishiki (ya-MAH-dah ni-SHE-key). Krupp and Bellomy were all ready to rock. They had built the brewery, received all the permits, printed the labels and experimented with sake recipes using numerous strains of koji and yeast. They thought their sake was good, very good, better than anything else domestically available. But not yet great. And then they heard about Arkansas rice farmer Chris Isbell and his crop of Yamada Nishiki rice. Isbell, of Isbell Farms, has been growing a small crop of this rice using seeds he brought back from Japan in 1996 and kept in the freezer for nearly 20 years. One of the first U.S. sake brewers found Isbell and he agreed to see if he could raise rice for them. Unlike most long- or short-grain rice, Yamada Nishiki rice has an opaque center, where the starch is concentrated. After the rice grains are milled, polishing away perhaps 50–­60% of the grain, the opaque center remains. 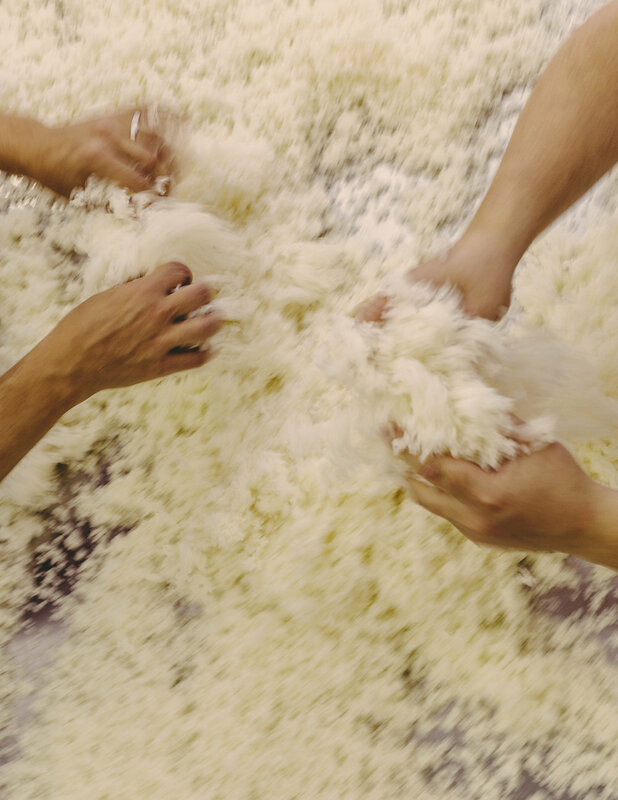 When the koji is applied, turning the starch to sugar, the fermentation process can penetrate to the center of the grain, not just lap around the edges. And that in a kernel is the difference between good sake and great sake—the two-part fermentation that transforms a single grain of milled rice into a great alcoholic tradition. Bellomy and Krupp made a test batch using Isbell’s Yamada Nishiki. It was good enough to convince them to put the launch on hold for more than four months so that Isbell could harvest a crop for them. “It didn’t make sense for us to start with one product and then change the recipe four months later,” Krupp says. Although, he concedes, it would have been nice to have some money coming in the door to help pay the rent. Could sake be the next big craft beverage? It could well be. If brewers and businessmen like the Dovetail team can educate the palates of chefs and motivate their more adventurous customers to taste the beverage without preconception. And perhaps not in a sushi restaurant. In fact, Bellomy thinks that sushi and sake are not a good pairing at all, since both depend on the same flavor profile: fermented rice. He likes beer with his sushi, and sake with everything else from a cheeseburger hot off the grill to a bowl of pasta. Now that I’ve drunk the sake-flavored Kool-Aid, a sake paired with a fine fish or seafood dish that doesn’t overwhelm its clean delicacy is a match made in Waltham, if not heaven. “Awesome possibilities lie ahead,” says Krupp. “We could have made a very aggressive, intense sake but we wanted to make a sake for the mainstream. We want Dovetail to be your gateway sake that will launch a whole new revolution of sake drinkers.” A gateway sake in Watch City. Imagine that. Buying notes: Dovetail sake is available at a small selection of fine Boston-area restaurants including The Tasting Counter and Café Sushi. For a full list of restaurants, as well as a list of where to buy it by the bottle, visit dovetailsake.com. Junmai—means “pure rice,” brewed with only four ingredients: rice, koji, water and yeast. Honjozo—brewed with distilled alcohol added at the end of fermentation. There are many delicious Honjozo sakes; however, all of the inexpensive table sakes are Honjozo. Ginjo—higher grade of sake, where the rice is milled to at least 60%. Daiginjo—the highest grade; the rice is milled to at least 50%. Double Parallel Fermentation—the brewing process that makes sake unique. Yeast is used to ferment sugar into alcohol in every brewing tradition (beer, wine, etc. ), but sake also uses koji microorganisms to convert the starches in rice to sugar for fermentation. It is the balance of these two processes that makes great sake. Koji—Aspergillus oryzae is the second microorganism used in sake making; the first is yeast. Before brewing, this fungus is grown on 25% of the sake-brewing rice. Growing it well is considered the most important step in sake brewing. Fune—the piece of equipment in a sake brewery used to press finished sake at the end of the brewing process. Chunky sake mash is pumped into bags and layered in a press, which uses either weight or hydraulics to press the finished brew. This labor-intensive method has lower yields, but makes a better sake than more modern methods. Rice Milling Rate (Seimaibuai)—sake brewing rice has starches concentrated at the center. The starch is needed for the koji to convert into sugar for fermentation. In Japan, milling rate is used to determine the grade of sake. The more outer layers (protein and fat) are milled away, the higher quality the sake. Nihonshu-Do—the traditional scale to measure sake gravity. In this scale, 0 is the gravity of water. Positive (+) numbers are lighter than water (drier) and negative (-) numbers are heavier than water (sweeter). Nigori—a style of sake that is unfiltered, leaving some rice particles in the finished sake. These styles are generally sweeter with much heavier, round feel.